GM Korea splitting into 2 entities, feared to dump Korean market. October. 22, 2018 08:05. by Kwang-Hyun Kim kkh@donga.com. General Motors unveiled the interior of the “Cruise AV,” a robot tax early this year. A robot taxi is a concept combining car sharing service such as Uber with a self-driving vehicle. A driver has to stay in the vehicle due to safety regulations for now, but the vehicle will develop into a completely unmanned autonomous driving system in a not-so-distant future. If the current taxi fare to a destination is 100 dollars, four passengers can share a robot taxi together for 25 dollars each, and the company can also save the labor cost of a taxi driver. GM Chairwoman Mary Barra forecast that the robot taxi’s profit ratio will amount to 20 to 30 percent. 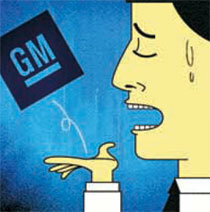 GM went bankrupt in the wake of the global financial crisis in 2008, but miraculously revived. Since then, the company completely dumped the goal of achieving No. 1 in sales in the world. GM’s global strategy and only interest at present is to make profit. “If GM cannot win in a certain market, we will leave the market or change our business model,” Chairwoman Barry told a press interview. She suggested a profitability of 10 percent as the barometer to determine whether to withdraw from a market or not. Instead, the company plans to bet on future automobiles including robot taxis and electric vehicles. Under this strategy, GM has withdrawn from five markets including Australia and Poland and closed 13 assembly plants, turning its headquarters into a surplus. GM Korea held a general shareholders’ meeting with only GM officials in attendance on Friday, and approved a plan that will divide the company into a production entity and a research and development entity. The Korea Development Bank, the second largest stakeholder in GM Korea, was not even allowed to attend the shareholders’ meeting. Even if the bank participated, the outcome will not be significantly different. Incheon Metropolitan City is considering a plan to cancel its lease of the Cheongna Driving Test Site to GM, and the automaker’s labor union is determined to stage an all-out struggle including strike action. The South Korean government invested a whopping 840 billion won (742 million U.S. dollars) in GM Korea in April this year, partly in a bid to earn time to prevent sudden mass layoffs. The conditions for this investment include GM’s pledge to operate a Korean plant for 10 years. GM decided to split the company into two different entities without adequate consultations with Korea Development Bank or its labor union, before pushing ahead to get the plan approved at its shareholders’ meeting, a move that can naturally spawn suspicion about whether the automaker will actually keep its pledge. Even so, it is difficult to block a global company from leaving an unprofitable market where it cannot make profit unless it can increases productivity by cutting costs during the period. While it is important that Korea make thorough preparations for GM’s suspected move to ‘dump’ the Korean market after acquiring the special favor of extra investment, it is also important that the Korean subsidiary step up efforts to increase productivity.